My mother, brother's girlfriend Aira, and I arrived at Incheon International Airport at around noon and purchased our T-Money card which can be used to pay for the subways, buses, and taxis. We took a bus to Jongno, the area of our Airbnb apartment. It was cold and rainy when we arrived at our stop. We got lost and drenched in the rain while looking for our apartment but as soon as we found it, we unpacked and rested for a while. We then took a subway to Myeong-dong and ate in Loco Quan 401 which is the restaurant owned by Haha, one of the members of the famous variety show called Running Man. Before we began eating, ate Aira left us to fetch my brother Martin at the airport. My mother and I went around Myeong-dong afterwards to shop for Korean beauty products (items were mostly on sale and they gave so many samples! ), and for clothes in Zara. After walking around, we went back to our apartment in Jongno-Gu. When my brother arrived, he rested for a while at the apartment and then all of us but our mom left again for Myeong-dong to eat. This time we walked instead of taking the subway (which we thought was a lot better since all we had to do was walk straight towards Myeong-dong for 8 minutes. We ate delicious barbecued ribs covered in melted cheese at James Cheese Back Ribs. The T-Money card costs ₩50,000 (₩4,000 for the card and ₩46,000 consumable credits). It was more than enough for our stay in Seoul! I was even able to get a refund at the 7/11 in the airport but I suggest that you have it refunded before going to the airport because I had to walk to a far 7/11 just to have it refunded. We started our day early and walked to Ssamziegil Mall from our apartment. Ssamziegil is a mall that sells a lot of crafty handmade items. It was nice to look at but we could have skipped it because we were not interested in the items the mall sold. 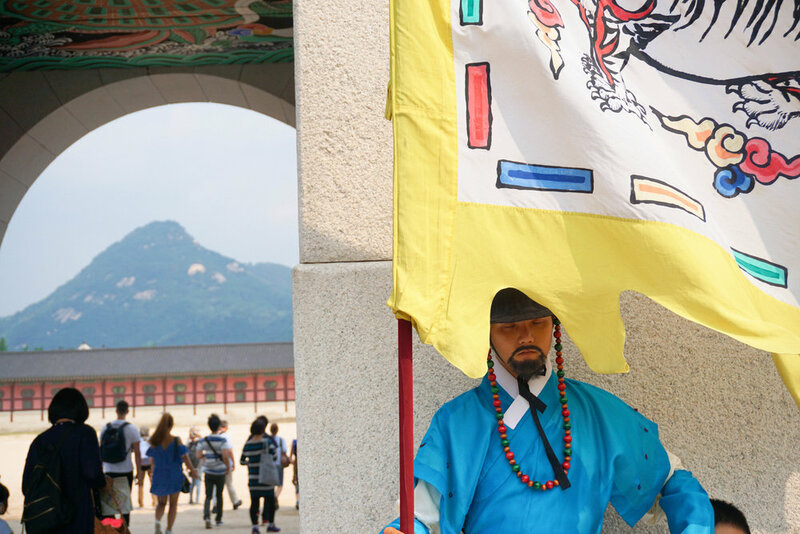 From there, we walked to Gyeongbokgung Palace - the largest among the five palaces in Seoul. It is a must-see because of the changing of the guard ceremony. Sadly, we only made it towards the end of the ceremony. We bought tickets shortly after to enter the palace. We got hungry because it was past noon but we could not find any restaurants near the area so we walked along Gwanghwamun Square towards the Gwanghwamun subway stop, rode the subway towards Dongdaemun and tried to find a bite to eat there. Luckily, we found a restaurant near our subway exit. The restaurant's been there since 1972. However, the restaurant's name was written in hangul. It's 강물집 잠숮불구이. We had galbi (Korean barbecue) for lunch. The store owners were the ones who cooked the meat for us and we kept requesting for more kimchi (go wild, it's unlimited haha). The food was great, I love grilled meat! I'm a fan of the Korean drama called Descendants of The Sun so we stopped by DOOTA Mall in Dongdaemun because there was a DOTS exhibit there (Pretty much the reason why we went to Dongdaemun in the first place). The exhibit was fun, they replicated some locations, and there were standees and posters of Song Joong Ki. My mother is also a fan so we both bought DOTS merchandise. Also, there's a nice view of the Dongdaemun Design Plaza from the DOOTA mall. - I wanted to go to DDP but the people I went to Korea with weren't interested so I had to skip it. My mother got tired from all the walking so we took a taxi to the Changdeokgung Palace. Sadly, we did not make it to the last entry to the Secret Garden so we walked towards the Bukchon Hanok village instead. The village is a must-see for those interested in Korean architecture and history because the area is full of traditional houses. You can even rent out a hanbok and wear it while walking around. We went back to our apartment to rest and walked to Myeong-dong in the evening to eat. • I suggest you take guided tours at the palaces - take note of the hours of the tour! Kuya Martin, Ate Aira, and I purchased a DMZ tour package before leaving for South Korea so we started our day extra early to be able to go to the USO Tour office located near the Namyoung subway station. The tour included a trip to the Joint Security Area in Panmunjom where all the negotiations between North and South Korea were held. We went inside one of the conference rooms and from there, we passed the Military Demarcation Line. Meaning we were able to walk on North Korea's side. The second stop in the tour was the Dorasan Train Station. The station ends in South Korea but the next stop is in North Korea. If ties between the two were good, the trains could pass through North Korea and reach Europe. The next was a panoramic view of North Korea and then the Incursion Tunnels (South Korea found out that North Korea dug tunnels. Years later, South Korea made it a tourist opportunity). Last stop in the DMZ tour was the museum tour and a short film viewing. The whole DMZ tour is worth going to if you have extra days in South Korea because you will end the tour with more knowledge and insight. We expected the tour to end late and leave us tired but we arrived back in Seoul at around 5:00 pm so we had time to freshen up at the apartment and set out again to go to the Namsan Tower. From our apartment at Jongno, we took the Subway towards Seoul Station. Road the subway (with transfers) until Gapyeong Station. From there, we purchased a bus ticket located at the bus stop right in front of the train station. The ticket was had a fixed route towards Nami Island, Petite France, The Garden of Morning Calm and back to Gapyeong Station. Our first stop was Nami Island and since it was drizzling, we decided to have lunch nearby. At first, I was sceptical because the place was not known and I always think that restaurants near tourist attractions don't have tasty food but I was wrong! That was when I realised that you can never go wrong with Korean food. Almost all the places we went to on our whole trip served delicious food. We all wanted to zipline to Nami Island but we couldn't because we were worried about our valuable items so we took the boat instead. When we got to Nami Island we walked around and looked for the bike rentals. If you can ride a bike, it's a must so that you can make the most out of your stay. It's a quick and fun way to explore Nami Island! After Nami Island we had to wait for 20-30 minutes for the bus to arrive. We then rode the bus for 30-40 minutes until we arrived at Petite France where My Love From Another Star and Running Man were filmed. It's such a bright and colourful place. We finished in about 30 minutes because the area was small and all we did was take photos. We went to a cafe in front of Petite France to kill time before the bus back to the Gapyeong station arrived. It was such a tiring day but we were hungry so went to Hongik University (Hongdae) for dinner. Hongdae was crowded with students and it was noisy because of all the street performers. It's a livelier and busier district as compared to Myeong-dong, which is what I prefer. My brother wanted to eat something different so we went to Krissko Taco for Mexican food. I was not in the mood for that cuisine but I was blown away because of the deliciousness. Again, the food in South Korea did not disappoint me. • Try to go to the Garden of The Morning Calm after Petite France. We did not go anymore because it would take another 40-minute bus ride from Petite France and we were worried we it would get too dark to appreciate the place. Instead of going to Lotte World and having a free day to explore Seoul alone, we all decided to spend an evening in Busan. We booked the apartment the night before and left for Seoul Station the next day. We thought we could order the 1 day (2-4 group) Saver Korail pass at Seoul Station but we were told to order online and print our ticket. Good thing the station had a place where we could use a computer for free but pay for printing. It was such a hassle to order and print tickets at the station. - We should've done it before our trip to save time. We took the KTX to Busan Station and from there we took the Subway to Jagalchi where our Airbnb apartment was located. Our apartment was easy to find but the host wasn't around so we thought we were locked out of our apartment. I tried contacting the host but she was not responding to me so my family went to the restaurant right below her apartment. Little did we know the restaurant owner also owned the apartment so she opened the door for us - It was open the whole time -_- The host did not tell me anything so we wasted time. After we settled down we rode the Subway to Haeundae station and took a taxi to the Haedong Yonggungsa Temple. - It's a temple by the water. It's definitely a must see if you're going to Busan! It started getting dark when we finished at the temple so we had a hard time finding buses and taxis that could take us back to the station. From a distance, I saw a Lotte Mall that seemed like an outlet so we decided to walk it. Instead of going straight home, we went shopping for gifts to bring back home. The Lotte Mall had Adidas, Nike, Gucci, etc. and prices were fairly cheaper compared to the other places we've been to (be it Hong Kong, the Philippines or in Seoul). Thankfully there were still taxis after we finished shopping. So we took a taxi back to Haeundae station and took a long subway ride back to Jagalchi. My family and I wanted to have a relaxed dinner at our pretty apartment so we just bought street food in our area. We bought a big serving of fried chicken fillet, 2 skewers of grilled chicken. My meal wouldn't be complete without rice so I bought from the convenience store - the rice was amazing, I must say! If you're sure about going on trips to cities around South Korea, be sure to check the Korail website to see if you can avail of the Saver Korail pass (You must be a group of 2-4 people). We availed of the 1-day pass so we paid ₩72,000 each instead of ₩81,000 - and that's from Seoul to Busan and back! We had to check out of our apartment by 10:00 am so we got ready, packed our bags and left it at the apartment before heading out to the Busan Station. From the Busan station, we rode a bus to the Oryukdo Skywalk also a nice place to go to during the day because of the panoramic view of the ocean. After the Skywalk, we took a bus to the nearest subway station and went to Centum City from there. Centum City is where the Shinsegae Department Store is located. Apparently, it's registered in the Guinness World record as the largest shopping complex in the world! We had lunch at the food court. Ate Aira and I ordered Japanese while my mother ordered a bibimbap with cheese and my brother ordered a spicy octopus noodle soup (strange but it tasted good)! After eating we did more shopping at the mall then bought Godiva soft serve for dessert. When we finished at the mall, we took the subway back to Jagalchi to get our luggage and headed to Busan station to take the KTX back to Seoul. We arrived Seoul pretty late so most of the restaurants near our apartment in Jongno were starting to close. Thankfully, we found a place called Madfry Chicken which was open (what I've been craving for). We ordered a marinated chicken as well as a normal breaded chicken to go with our sauce. Wow. The chicken was so good, it was crispy on the outside, soft and juicy inside. Best way to cap our last evening with my brother! Our last full day in Seoul was pretty relaxed. We started our day later (which was great because our feet was tired from all the walking since day 1) so we went back to the restaurant (강물집 잠숮불구이) in Dongdaemun for lunch. - Our last galbi meal before leaving South Korea. After lunch, we went to the market to buy more gifts to bring back home. I was able to buy a lot of caps for myself and for my friends (a lot cheaper compared to Hongdae and Myeong-dong). After the market, we went back to DOOTA to shop at the duty-free (honestly it was a hassle because we couldn't get the items we purchased, we had to pick it up at the airport). Of course, no surprise, we went back to Myeong-dong for more shopping and street food! My family shopped in Uniqlo, H&M, Forever 21, and Zara. - I love Myeong-dong, it's complete haha. We were still full from our lunch so we had dessert at Sulbing Korean Dessert Cafe instead. Even if ate Aira and I were full, we tried to make room for more street food so she bought a grilled octopus skewer, and I bought battered shrimp and grilled scallop with cheese - THE BEST FOOD AVAILABLE IN THE STREETS. I SWEAR! I love Myeong-dong so much hahaha. We ended our evening a bit earlier as well because my brother had to fly back ahead of us. We had heavy luggage so instead of taking the bus, we took a taxi from Jongno to Seoul Station and bought the ticket which directly takes you to Incheon International Airport. - This was a lot easier because Ate Aira helped us bring our things to Seoul Station (she did not have anything with her because her trip in Seoul was longer than the rest of us). At the airport, my mom did the tax refund while I had to walk far to the 7/11 to refund our T-Money cards. Afterwards, we checked in. However, we weren't able to relax because we still had to claim the items we bought from DOOTA. We had to take the train inside the airport to get to the other side where the claiming area was located. It was a good thing it was close to our gate because if not, it would be time-consuming and hard to take the train back and forth. It was also a good thing that we were not chance passengers because if flights were full, we might not even have the time to pick up our items because we would have to board as soon as we're approved. (I'm usually a chance passenger because my father was an airport employee but my mother and I purchased the Air Asia tickets instead because it was almost the same price if we were to fly with the airline discount and at least we had guaranteed seats). And that ends my LONG (~diary~ LOL) entry on South Korea. It was a fun trip with my mother, brother, and his girlfriend. They're fun to travel with but I wish I had more time to visit museums, parks, and theme parks. But I'll save that for my next trip back. I loved Seoul so much. It's a perfect mix of history, culture, and the modern life. I also recently became a fan of Korean dramas so it was fun to see the Korean stars on print ads!